The original Samsung Galaxy Camera was notable because, although it wasn't the first dedicated camera to use the Android operating system as its user interface, it was the first to integrate an up-to-date version of the operating system with great success. It made a lot of sense, was a great Android device that could rival many smartphones, and yet it missed the mark when it came to some of the more critical camera features. And given that it was supposed to be a camera first and foremost, it therefore failed to deliver on its full potential. 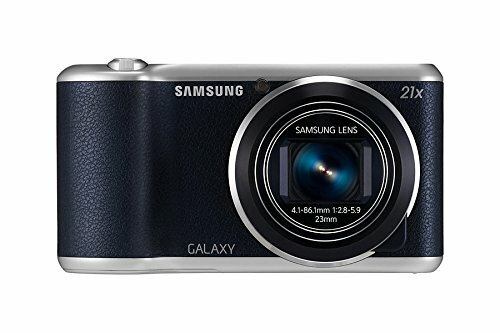 Enter the Samsung Galaxy Camera 2 and, well, it looks a lot like the original device. It's actually a little larger in size, yet retains the same 21x optical zoom lens, while bumping the processor speed and software version up a notch. The only way is up. This time around Samsung has chosen to ditch the SIM slot making the Galaxy Camera 2 a Wi-Fi only device when it comes to sharing. So no 3G/4G for on-the-go sharing from the second-gen device. Has the sequel's shift in direction proven enough to make the Galaxy Camera 2 a viable do-it-all camera solution, or does it fall into the same traps as the original model? Samsung has spent years perfecting its Android-based smart devices and so has directly transferred a lot of that knowledge - and technology - to its camera division. The result in the Galaxy Camera 2 is a decent device with an excellent Android backend that works well as a conduit for sharing your photos. Innovation thrives in the face of competition, but as yet rivals for the original Galaxy Camera are few and far between. It's perhaps no surprise, then, that the second edition Galaxy Camera doesn't so much revolutionise the concept as round off a few rough edges. Samsung knows it is streets ahead when it comes to Android and no other camera maker is anywhere near its door. The Galaxy Camera 2 is more attractive than the original model. With a silver top and bottom in place of the wrap-around plastic on the original device; the lens housing chiselled outwards, rather than in towards the glass; and the same pressed leather effect on the grip and across the front of the chassis as we saw on the lovely Samsung NX300. It's less plastic and better for it. The flash now also pops forward on a small arm rather than straight up, as it did in the original, which will help to avoid the lens casting a shadow when it's fully extended. That was a problem with the original camera because the lens was so massive, so it's good to see Samsung making some essential changes. Overall, the chassis has been gently softened, with rounded edges and a new, slightly more comfortable ridge on the back against which to rest your thumb to stabilise the camera when shooting. All of this, and the fact that it's shed 17g compared to its predecessor helps disguise the fact that it's actually a few millilitres taller, wider and fatter than the original. That's difficult to see, though, even with the two cameras standing side-by-side. Samsung has slightly tweaked the core specs too. The processor has been upgraded to clock at 1.6GHz (up from 1.4GHz), which falls in line with the same processor found in the top-spec Samsung Galaxy S4 smartphone. This makes Android applications feel more sprightly so if you want to play the latest games then make no bones about it: the Galaxy Camera 2 is super-fast and capable. However, where the original model came with the option of either Wi-Fi alone or Wi-Fi and 3G, the Galaxy Camera 2 has ditched the SIM slot for Wi-Fi connectivity only. So it's less "telephony" in this regard, but perhaps that's a good thing. We're not so worried about this where the camera functions are concerned as you can use Samsung's free apps for iOS and Android to control it remotely via your smartphone and access your shots for sharing over social media or email. Over the longer term it's likely we'd miss the convenience of 3G/4G when using it tablet-style to run regular Android apps. In most other respects the Galaxy Camera 2 echoes the performance of the original. That includes the highs and, unfortunately, the lows. Both models each have a 1/2.3in back-side illuminated CMOS sensor delivering 16.3-megapixel images. Up front of this there's that 21x zoom, which delivers a 23-483mm equivalent. The maximum aperture at the wide-angle is f/2.8, dipping to f/5.9 when zoomed in to the max. At the wide-angle end it's a capable device, in part thanks to that wide maximum aperture, but less so as the zoom extends. The second-generation camera has 8GB memory - twice the memory of the original, shared between the Android OS, any applications you install, and your photos and data - and is bundled with a 50GB Dropbox account. This is a boon, as it means that when shooting with a Wi-Fi connection you can set your images to upload directly, at which point they'll automatically sync to your PC or Mac. The difference Dropbox makes to the way you work isn't to be underestimated. Use it in an online or print production environment, and the shots will be waiting on your design machine right away; at a party they're ready for sharing immediately, or viewing on a larger display. As displays go, the 1280 x 720 pixel 4.8-inch touchscreen featured in the Galaxy Camera 2 is no slouch. That resolution is far beyond any competitor camera we could name, even at the professional end of the spectrum, although 4.8-inches is massive for a camera. It's an undeniably large device. The display really comes into its own when you're shooting. It has to: other than the shutter release, zoom rocker and pop-switch for the flash it's your only means of control. You can tap to both focus and fire the shutter, and use a second tap to set an exposure point independently from the point of focus. You can also pinch to control the zoom. The regular auto mode is supplemented by the full range of aperture and shutter priority, manual and program modes, with each controlled by dragging tiered on-screen tumblers into the appropriate positions. It's easy to get to grips with, and the screen is bright enough to view even in sunlight. We do still pine for an extra physical button here and there, though, just as we did with the original Galaxy Camera. Autofocus meant it was easy to get a fix on exactly what we wanted to shoot, with the camera correctly identifying what we were after most of the time. A single tap on the screen acts as enough to redirect its attention on the rare occasions it didn't. Colour reproduction in the shots we captured was a particular highlight, even under demanding conditions. When shooting a white wall in almost direct sunlight it was still able to accurately render the texture of the underlying brickwork, while flowers, which are easy to over-expose under such conditions, remained true to the originals. However, we did notice some heavy-handed compression in some areas. This was evident particularly in areas of high complexity, such as the mesh of branches and twigs on a tree, or leaded window frames set into brickwork. This wasn't obvious when the image was resized to fill the screen, but zooming to 100 per cent once they had been downloaded revealed the imperfections. Where low-detail subjects, such as the broad petals of a poppy, met a more textured background, the edges were fairly crisp and well observed. However, use that 21x zoom and that sharpness doesn't hold up as the zoom extends which is a shame - this being the single biggest issue of the original camera. There is also some variation in the level of focus when comparing the centre of the frame with the edges and corners - the latter being soft by comparison. We were also a little underwhelmed by the bokeh effect in shallow depth of field shots, which again highlighted the level of compression rather that providing an attractive backdrop. Sensitivity runs from ISO 100 to ISO 3200, with clean results at the lowest end of the scale as expected. You'll start to notice grain appearing at ISO 800, which becomes more evident as you step up from there. Although this means that very fine detail is lost at the upper end of the scale, colours remain accurate and well balanced throughout. The Galaxy Camera 2 shoots video at a maximum of 1920 x 1080 at 30fps, or 1280 x 720 at 60fps, with lower resolutions suited to immediately sharing online also available. The results again demonstrate faithful colour reproduction. With the Quiet Zoom feature enabled you can safely use the optical zoom without the sound of its motors dominating the recording too. It does dip the mic sensitivity slightly, but even this is handled with greater subtlety than many of its competitors. So how do we judge the Galaxy Camera 2 overall? As a camera, its image quality is on a par with a regular mid-range compact and the wider end of the zoom, but its 21x zoom is trying to do too much and doesn't deliver bitingly sharp images as the zoom extends. What does really sell the camera is its Android interface. It's streets ahead to the point the ailing competition aren't even in the game. The Android 4.3 (Jellybean) implementation is a triumph, the Dropbox upload is seamless and the sharing options can't be bettered by any dedicated camera out there. The Galaxy Camera 2 currently retails for one pound shy of £400, which is a touch rich for a compact, but that's not to say that it's necessarily overpriced. It's got a mixture of the Samsung Galaxy S4 and S3 smartphones' innards so you get a lot for the money. But you should really only be buying the Galaxy Camera 2 if you'll also make use of its Android back-end, at which point you can offset a lot of the cost with the savings you'll make by not buying a separate device. Just bear in mind that if you want to get online beyond the reach of a Wi-Fi network then you'll need to set up a two-box solution. It might therefore be fairer to consider the Galaxy Camera 2 more like a bespoke mini tablet, with its focus tilted toward photo capture. At that point it makes a lot of sense for Instagram, Flickr and Twitter addicts, although if you already have the first generation device, there's simply not enough new here to justify the price of an upgrade nor enough changes to shift its score up a notch. Samsung has got much of the concept right. But as a camera - and that's what this is meant to be first and foremost - it carries forth the same mistakes as its predecessor. It's a bit too big, the lens is excessive and the device's main shortcoming due to its optical limitations. Produce a smaller screen, pair it with a higher-end lens and wrap that around the existing excellent Android operating system and we'd be highly impressed. For now it's a case of so close yet so far.